In the triple-A industry, it pays to be self-aware. Apex Legends is (1) a hero shooter, (2) also a battle royale game, (3) with loot boxes, (4) published by EA, (5) releasing in the same month as another trend-chasing online shooter – from the same company, no less – (6) and set in the same universe as cult-favorite Titanfall, but developed in place of an actual sequel. We have every reason to be skeptical of this title, and Respawn knew that. So instead of dealing with a potential PR hurricane, they released Apex Legends the same day they announced it and let the game speak for itself. We’d have been fools to doubt them, of course. Respawn was formed by the duo who created Call of Duty and gave us some absolute classics (the original Modern Warfare is still a masterpiece), and they only jumped ship once the series began regressing into the omnipresent corporate slush that it’s become. Under Respawn, they made Titanfall, one of the most exhilarating multiplayer shooters of the generation. So Respawn is just better at this sort of thing than pretty much anyone else. I boot up PUBG or H1Z1 and I’m greeted with buggy programming and janky controls, and set free amongst a selection of store-bought assets tossed about on a terrain shaped by someone with a Blender for Dummies book on his shelf. Apex Legends, on the other hand, looks sharp, runs at a cracking 60fps, and plays like a dream. The market may be flooded with battle royale games, but none have been so instantly identifiable as the work of experts — true masters of their craft. Anyone who’s played a BR game will immediately recognize the formula. Players are airdropped onto a large island wherein they must scramble for supplies and fight to be the last person standing in a winner-takes-all contest. An ever-shrinking safe zone forces players into encounters as numbers dwindle. We’ve seen this before. Of course, we’ve rarely seen it this polished right out of launch. Although many Titanfall fans were disappointed that the next game set in that universe would debut without pilotable mechs, it’s worth noting how fast and slick those games felt even when we weren’t stomping around in our Titans. 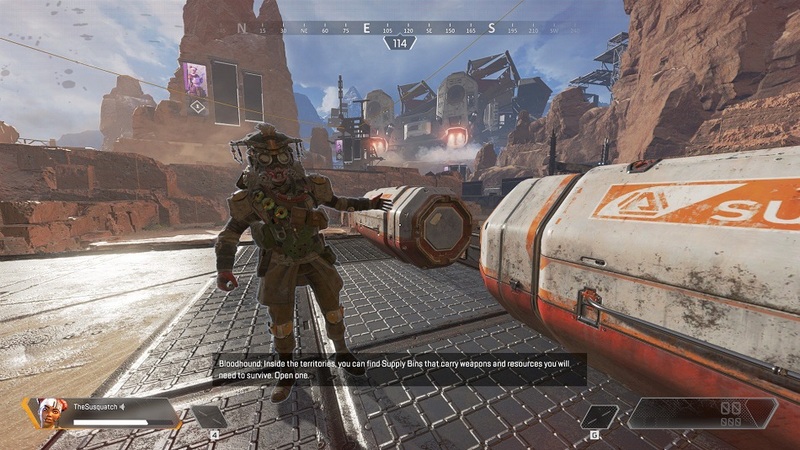 The playable characters of Apex Legends can still dash, slide, and vault with effortless aplomb, morphing basic combat into an acrobatic frenzy. The game is also full of ziplines and hot air balloons that can launch players into the air for speedy relocation, making long trips across the map considerably less of a slog. 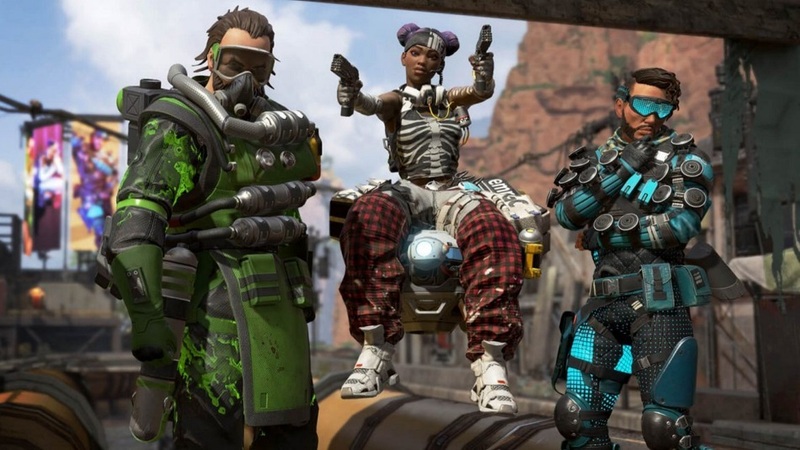 Although there’s no grand, defining gimmick separating Apex Legends from its competition, a number of small but significant tweaks have made it quite possibly my favorite BR game yet. Since team play is mandatory – there is no solo mode – Respawn has put together a new communication system that allows players to highlight places or items of interest without the need for a microphone (though one of those will always help). It’s called the “ping” system. I simply point to something and press a button, and the entire team will be alerted to what I just highlighted. If I find a valuable item that I don’t personally need, I ping it, and my character will verbally announce its presence to the group who will then see it as a waypoint on the screen. If I notice enemies in the distance, I can warn my teammates with a quick ping. The function can even be used to suggest places to explore, or locations to drop at the start of a match. It is, frankly, a brilliant addition. Some form of communication is borderline mandatory in games like this, but not everybody who plays is guaranteed to have a microphone, and hell, not everyone speaks the same language. With pinging, Respawn gets so much versatility out of a single button press that can translate into seemingly a thousand things. Even the fact that I can acknowledge or agree with a teammate’s ping by tagging it myself is a great choice. 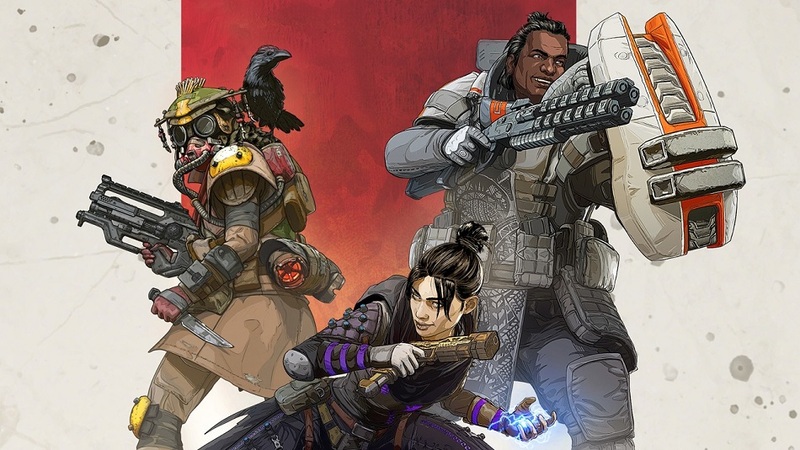 Also noteworthy is how death works in Apex Legends. As expected, when a player is downed, they can be revived by a teammate. If they bleed out, however, it’s still not the end. Another player can pick up their fallen comrade’s “banner,” take it to one of several respawn points dotted about the map, and resurrect that person, good as new. It’s a lovely method of slightly lowering the usually-tense stakes of BR games while also driving home the importance of relying on one’s teammates. 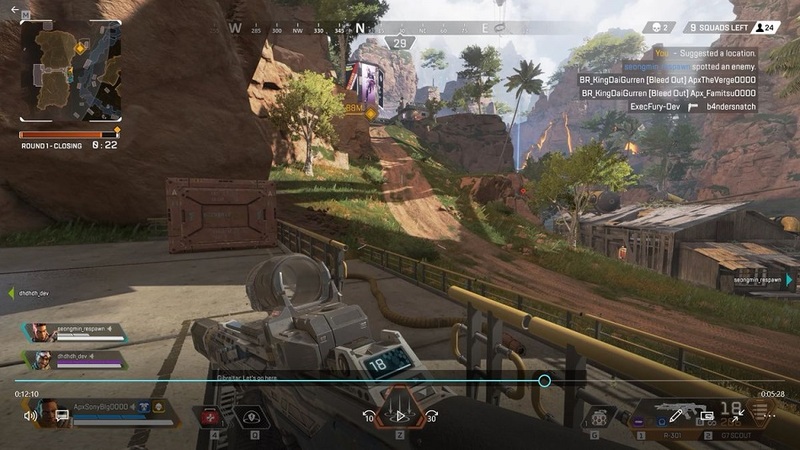 I mentioned that Apex Legends is also a hero shooter, as it draws influence from the popularity of Overwatch by giving its characters unique active and passive abilities. 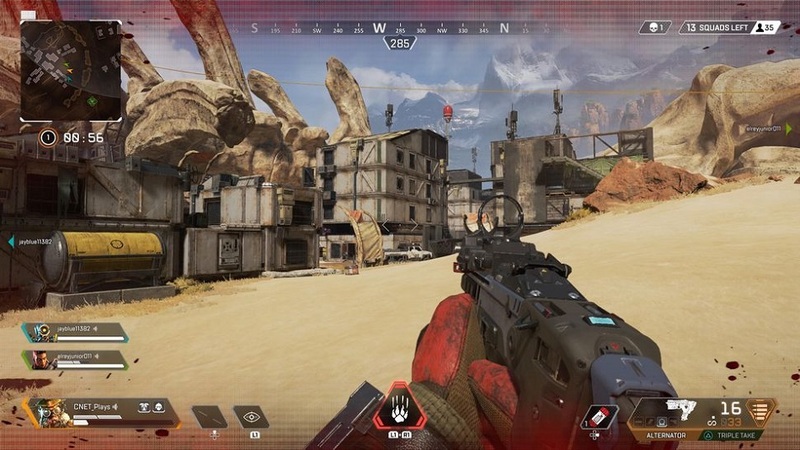 This isn’t a make-or-break component of Apex Legends – I don’t expect many people to stress about “optimal comps” – but it gives everyone an important role on the battlefield. Powers include throwing down shields or smokescreens, calling in medical drones, and setting up custom ziplines. The “legends,” as they’re called, chatter throughout matches, and have well-defined personalities without being annoying or over-exuberant. Respawn also deserves major kudos on the hot topic of representation. The starting roster consists of a non-binary character, a gay man of Pacific origin, three women (two of whom are black), and a robot. The only identifiably white man is hidden behind a paywall (or a lot of grinding) and poison-themed, so he’s described in-game as “the Toxic Trapper.” Toxic. I refuse to believe that that was an accident and I love Respawn for it. Disclosures: This game is developed by Respawn Entertainment and published by Electronic Arts. It is currently available on PlayStation 4, Xbox One, and PC. This copy of the game was obtained via free download and reviewed on the PC. It was also played on PS4 a bit. Approximately 25 hours of play were devoted to the multiplayer mode. There is no single-player mode. Parents: According to the ESRB, this game is rated Teen and contains Blood and Violence. Obviously it’s full of gun violence, but none of it is terribly realistic and the blood effects are minimal. Colorblind Modes: There are three colorblind modes available for protanopia, deuteranopia, and tritanopia. Deaf & Hard of Hearing Gamers: Subtitles are available. This being a competitive multiplayer game, anyone who can’t listen for incoming threats will be at a disadvantage, though on-screen indicators inform players as to which direction they’re being attacked from, and teammates who use the ping system can help visually highlight points of interest. The game offers the ability to convert voice chat to text, or vice versa. I’ve tested both and I’m surprised how well they work. Players can also activate visual or aural instructions for using chat functions. Respawn did a great job with this one. 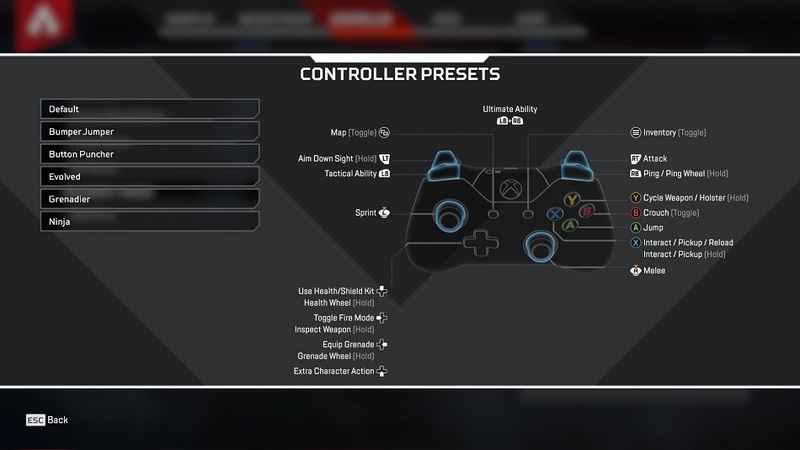 Remappable Controls: This game offers fully remappable controls for mouse and keyboard, as well as a number of presets for controllers, which mainly change which buttons the jump and melee actions are mapped to, and swaps analog stick functions. Great review. I should really give this game a try; I rather liked Titanfall 2. Have you heard about any backlash re the representation decisions here? I have not, though admittedly I may have just done a good job of avoiding it. I like Free To Play Battle Royale first person games with no building mechanics. Apex Legends is really tempting. However, I’m a bit skeptical since it’s from EA, a video game company known for incorporating lootboxes and p2w aspects. Otherwise, I feel like it’s going to be as fun as Fortnite, PUBG, Rules of Survival, and CS: GO. Great review by the way! Thanks for reading! Yeah, I’m pretty surprised how uncynical the game feels, considering that it’s from EA. At the very least, since it’s free, you don’t have much to lose by trying it.